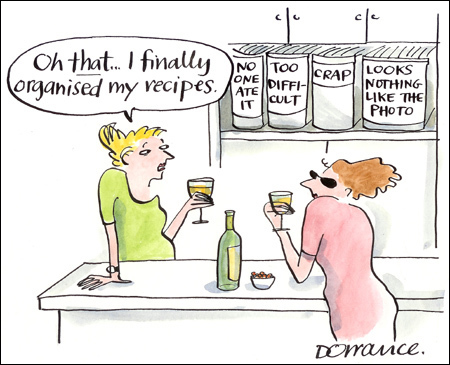 A cartoon on organizing recipes from Denise from Denise Dorrance, an American living in London. You can see more cartoons at “denicedorrance.com”. I’m having problems with my links at the moment, so just cut and paste http://www.denisedorrance.com into your browser. Jami, I don’t know if you saw it earlier, but I posted a peanut butter lava cake recipe. As for chocolate lava cake, I haven’t made one in a while and wouldn’t be able to steer you toward a personal favorite. However, a lot of people seem to like this one from Cooking Light. It has pistachios, so it’s kind of different. I pasted the recipe below. Under the recipe, there’s a link to CL’s Recipe Finder, where you can go and read the actual reviews. Tracy, I emailed you. At least I think I did! Joe, don’t remind me. I still feel bad about not calling on you guys the last time I was, uh, 10 feet from your house. Kelli, I put the cartoon up then took it down because I wasn’t sure Denise would like me slapping her cartoon on my blog. She was very sweet and said I could post it. I’m really glad, because I couldn’t find any cooking cartoons that were as funny and was worried I’d have to draw one myself. That cartoon actually made me laugh out loud. Because, without ever realizing it, that is pretty much how I sum up recipes in my head! Have fun in Scottsdale. You sure are the mighty traveller these days. Just teasing, hope you have a great time! Shouldn’t be too hot, yet! Are you doing a publicity thing in Scottsdale? Just wondering because I live outside of Phoenix and would come see you if so. Otherwise, have a nice trip – we’re having great weather!